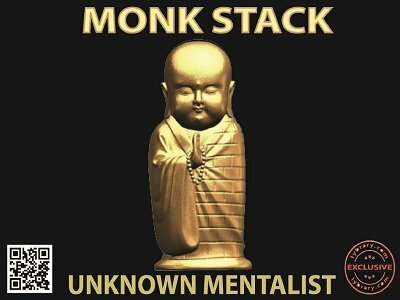 The Monk Stack is a simple cyclical stack. It was designed to solve two famous problems of the Si Stebbins stack and the 8 Kings stack. Like the Si Stebbins stack, this does not have an obvious sequence. And unlike the 8 Kings, this does not need the memorization of a mnemonic. In fact, the single, simple rule of the Monk Stack is so easy that you will learn the stack instantly after reading the rule. Not only that, it will also be almost impossible for you to forget the rule thereafter. Frankly, the cool rule which is the core of the Monk Stack can be stated in just one single sentence. The rest of the content in this manuscript is the mandatory stuff like 'Introduction', 'full stack table' etc. Most of the routines which are out there for Si Stebbins or 8 Kings stacks should be possible to be performed with the Monk Stack . Basically, any routine which just needs the performer to know the next card to the 'peeked' card should be possible with this Monk Stack . The Monk Stack should be ideal as a 'transition' or 'stepping stone' stack for beginners in stack magic who find Si Stebbins too obvious, 8 Kings too time taking and other memorized decks to be still some time away for investing substantial amounts effort. Of course, with the exception of the Karma Deck . The regular stack magic practioners may find this idea novel, interesting and refreshing.